The Pressurized Mating Adapter-3, an old docking port, is relocated from the Harmony module to the open port on the end of the Tranquility node on the International Space Station on Feb. 15, 2009 during the STS-130 mission. Astronauts moved anold docking port to a new spot on the International Space Station late Monday in thesecond straight day of tricky crane work 220 miles above Earth. 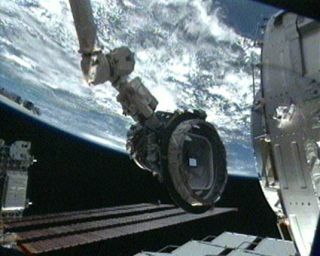 The astronauts used the station?s 57-foot (17-meter)robotic arm to attach the old docking adapter, a cone-shaped connecting piece,from the top of the orbiting lab to the outboard end of its newest roomTranquility. The crane work ended at 9:28 p.m. EST (0228 Tuesday GMT) and came one day after a new observation deck was plucked from the end of the Tranquilitymodule and attached to a bottom port, where its seven windows are expected togive astronauts unprecedented viewsof Earth and space. The $27.2 million observationdeck, called the Cupola, and the $382 million Tranquility module were bothdelivered by NASA?s space shuttle Endeavour, which docked at the space stationlast week. They were built in Italy for NASA by the European Space Agency. Station astronauts hooked up the electrical and plumbinglines for the observation deck to begin activating its systems. The metalshutters protecting the lookout?s windows will be unlocked during a Tuesdayspacewalk and may be opened for the first time by Wednesday or Thursday,mission managers said. ?The Cupola, I think, is really one of the mostspectacular viewing platforms that we will have had in space like this,? said shuttleflight director Kwatsi Alibaruho early Monday. ?We?re eagerly awaiting therelease of the shutters and the first views from it.? The old docking adapter, called Pressurized MatingAdapter-3, was previously attached to the top of the station?s Harmonyconnecting node. It was moved to the outboard end Tranquility, which is a bus-sizedmodule attached to left side of the space station?s central Unity node. The 10-year-old docking port will be used as a small storagespace and protect Tranquility?s end cap from exposure to space, NASA officialssaid. NASA engineers will keep a close eye on the dockingadapter to make sure that a nearby space station radiator doesn?t get too closeto it. If it does, the docking port may have to be moved back to its originalspot, mission managers said. Endeavour?s six astronauts and the five-man Expedition 22crew on the International Space Station are expected to take a half-day offlate Monday before preparing for the third and final spacewalk of their jointmission. ?With this crew, we haven?t had to twist their arm toomuch to get them to take the appropriate amount of free time off,? Alibaruhosaid. Mission Control reminded the astronauts to be sure to lookout the window and savor the view during their time off. That spacewalk is slated to begin late Tuesday night andlast more than six hours. Endeavourlaunched Feb. 8 and is due to depart the space station late Friday. The shuttle is slated to land in Florida on Sunday night.